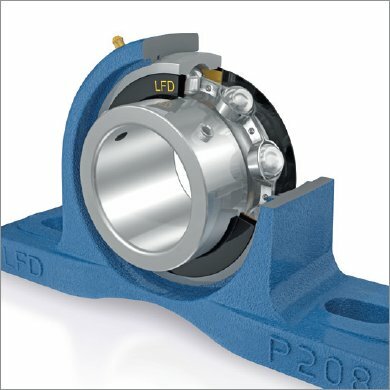 The LFD bearing units programme includes bearing units and housing types in many versions, which can be combined with each other. On the whole, a differentiation is made in the housings between pillow block or flange bearings and in regard to the material a distinction is made between casting and sheet steel. Search our database for technical information, dimensions and other details on bearing units, flange bearings, pillow block bearings, insert rolling bearing units, bearing unit inserts. It is clearly sorted for the search by GREY CAST IRON, SHEET STEEL, INSERT ROLLING BEARINGS and BEARING INSERTS. Special materials such as plastic or rust-retardant materials are also available on request. The bearings primarily differ in regard to their respective mounting type. Here, LFD Group offers the following different mounting types: Set screw, eccentric ring, clamping sleeve and interference fit. Our bearing units – pillow block bearings – flange bearings run through our own quality control systems. Information on the in-house LFD test and development laboratory can be found here. Depending on the load and application, a cast housing or two-part cast housing or steel sheet housing is used on bearing units. LFD offers the suitable bearing unit for each specific application. The detailed bearing unit catalog of the LFD Group will provide all important information on the designs. With one-piece cast housings and sheet metal housings, the angle and possible misalignments can be compensated on bearing units. The modular system is the advantage of the two-part steel sheet housing of bearing units. Your contact partners: +49-231-977250 Fax +49 - 231 - 977 25 250 - Internet: www.lfd.eu - Please feel free to download our complete bearing unit catalog here.